Mme Fleury’s teacher, Carolus Duran, was a portraitist who rejected the conservative teaching of the Ecole des Beaux-Arts, sympathizing with the style and technique of his friend Manet; he infused his students with his own radical approach, including Fanny Fleury, whose best work can hint that she emerged from the same stable as Sargent. Her portraits and figure paintings are generally realistic and occasionally romanticized, but those which stand out are the compositions based – like this one – on carefully considered colour harmonies. The present picture is a tranquil image in which the nominal subject becomes the excuse for the interplay of shades of blue, mauve and silver, offset with touches of terracotta and green. The unconsciousness of the viewer in the model emphasizes the fact that this is not a portrait in the sense of a representational likeness, but decorative arrangement which looks towards the work in England of Albert Moore and Whistler. Fanny Laurent was born in Paris in 1848, apparently marrying at quite a young age; her pictures are signed with her married name, Fleury. She was a pupil of both Jean-Jacques Henner and Carolus Duran (the latter opened his own studio in 1872 and also taught John Singer Sargent), and became noted as a portrait and figure painter, although she also produced genre scenes and still life paintings (such as Trophées de chasse & de peche, and Still life with roses and raspberries). She showed her work at the Salon from 1869 until 1882, and received an honourable mention in the 1889 Exposition Universelle. 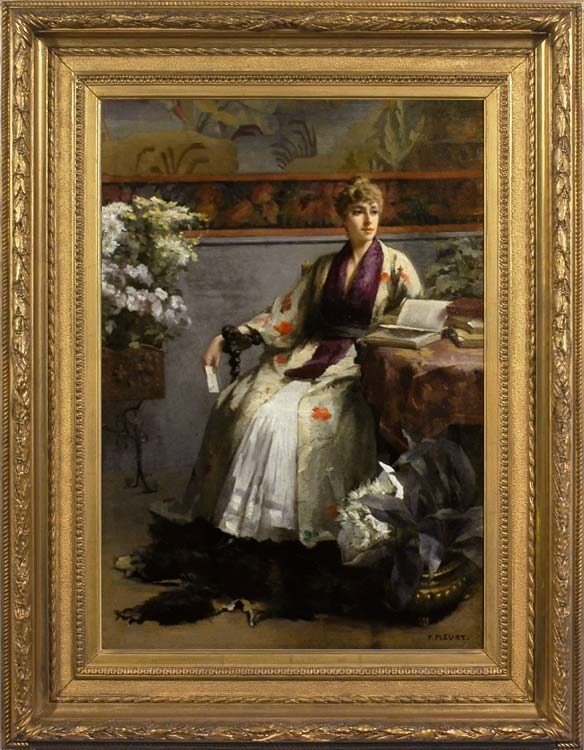 She also exhibited in the Salons of St-Etienne and Dijon, and her work can be seen in the Musées de Béziers (L’abri de Varech) and de Cette (Le repos du modèle).